A new anti-immigrant law has taken effect in Alabama, striking fear into the state’s small Latino community—citizens, documented and undocumented immigrants alike. With even harsher provisions than Arizona’s infamous SB 1070 and a similar measure in Georgia, the Alabama law empowers police to question and detain anyone suspected of being “foreign” and forces schools to track their students’ immigration status. It also imposes new restrictions on immigrants’ ability to sign contracts, threatening their access to housing and utilities. Enacted under Republican governor Robert Bentley, the law took effect on September 29 after most of its provisions were upheld by U.S. District Judge Sharon Lovelace Blackburn. In response, Latinos have fled the state or hunkered down at home, afraid to report to work, let their kids attend school or even make a run to the grocery store. A taxi driver in Birmingham told investigators from the American Civil Liberties Union that people have asked him to drive them as far as New York and Indiana, likening these trips to the Underground Railroad that took escaped black slaves “up North” to freedom (“ACLU Report from Alabama,” 11 October). A tomato farmer in north Alabama told Fox News that only eight of the 48 Hispanic workers she needed for the harvest showed up after the law took effect and that she and her husband were shopping for them because they feared arrest. Meanwhile, many parents have rushed to draw up powers of attorney designating guardianship of their kids who were born here and have U.S. citizenship should the parents be jailed or deported. Latino immigrants and their supporters have tried to fight back. At least six poultry plants in northeast Alabama shut down or scaled back operations on October 12, which had been declared a “Día sin Latinos” (Day Without Latinos). Organized principally through La Jefa radio, the protest by poultry workers coincided with the closing of Latino-owned restaurants and a school boycott. On October 14, an emergency stay by the Eleventh Circuit Court of Appeals blocked the checking of student status at enrollment and the provision of the law that made it a crime for immigrants not to carry proof of legal status. But the limited, temporary stay has done little to mitigate the sweeping criminalization of immigrants in Alabama. Combined with the spectacle of the Republican presidential candidates’ debates, where Mitt Romney, Rick Perry et al. bait each other on who’s “soft” on immigrants, the new laws passed by Republican state legislatures no doubt serve to reinforce illusions that the Democratic Party is the “friend” of immigrants. But the biggest enforcer of anti-immigrant repression is the federal government under Democrat Barack Obama, who took office soon after the outbreak of the world capitalist economic crisis. In mid October, immigration officials announced that they had deported just under 400,000 people over the last year—a record number for a single year. This is largely due to the Obama administration’s drastic expansion of the “Secure Communities” program initiated by George W. Bush. Under this federal dragnet, all those jailed, no matter how minor the alleged crime, have their fingerprints checked against FBI criminal databases and Homeland Security immigration records for possible deportation or detention. Just as immigrant workers are brought in during economic boom times to provide a pool of low-wage labor, the current anti-immigrant crackdown is at bottom a product of the economic depression, as the capitalists have less need for such labor. This is not new: mass deportations were also launched during the Great Depression of the 1930s under both Republican Herbert Hoover and his successor, liberal icon Franklin D. Roosevelt. The capitalists everywhere seek to inflame racial, national, religious and other tensions in order to divide the working class and weaken its struggles against exploitation. Today, attacks on immigrants go hand in hand with brutal austerity measures being enforced against the entire working people. Defense of immigrants is of vital interest for the labor movement and all fighters against racist discrimination. 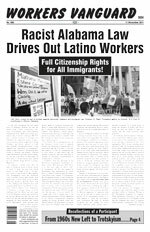 The Spartacist League calls for full citizenship rights for all immigrants! Anyone who got to this country should have the same rights as the native-born, including the right to hold a passport, which would allow them to travel to their home countries and back. As Marxist opponents of capitalist class rule, we do not seek to advise the bourgeoisie on its immigration policy or to offer reforms to “clean up” its enforcement techniques. We fight for workers revolution that will replace the crisis-ridden capitalist profit system with a planned economy on a world scale, in which the workers in power will worry about the ebbs and flows of labor migration and the world economy more generally. In Alabama, nativist hatred of “foreigners” is intertwined with the state’s history as the heart of the slaveholders’ Confederacy and later a bulwark of Jim Crow segregation. With farmers howling about the loss of labor as immigrant workers are driven away, Alabama has announced that it will take a page from that history for a solution: the use of prison labor to work in the fields. Already in Idaho, convicts have been put to work picking, sorting and packing potatoes, and similar programs are in place in Arizona and elsewhere. Even the Wall Street Journal (18 October) felt compelled to point out that “convict labor has a dark history in America, notoriously in the post-Civil War South, when thousands of African-Americans endured what historians say was a kind of de facto enslavement as prisoners on chain gangs.” In Alabama in 1908, the state government sent convicts to work in coal mines owned by U.S. Steel in order to break a strike by thousands of black and white members of the United Mine Workers. The link between the struggles for immigrant rights and black rights is today glaringly evident in Alabama. Writing in the Washington Examiner (21 August), Wade Henderson, president of the Leadership Conference on Civil Rights, noted that the Alabama law “seeks to frighten undocumented immigrants into leaving the state or going deeper underground, where they will be vulnerable to exploitative employers, unscrupulous landlords and violent criminals. While today’s bigots have found more sophisticated ways to intimidate minority groups, there’s a short distance between Bull Connor and today’s slumlords, sweatshop owners and anti-immigrant demagogues.” The vile segregationist Connor, Birmingham’s Commissioner of Public Safety in the early 1960s, was notorious for setting police dogs and high-pressure hoses against civil rights demonstrators. The keynote speaker for a recent rally in Birmingham against the new Alabama law was Democratic Illinois Congressman Luis Gutierrez, whose speeches often link opposition to anti-immigrant measures to the civil rights movement of the 1950s and ’60s. The struggles of that time broke the back of Jim Crow segregation in the South. But the program of the liberal civil rights leadership, which preached reliance on the capitalist courts and the Democratic Party, derailed the fight for black freedom as it confronted the all-sided racial oppression that is embedded in the structure of American capitalism. Reliance on the Democratic Party and the capitalist state is no less a dead end in the fight for immigrant rights today. Gutierrez played a prominent role, along with a host of Democratic Party politicians, Catholic church figures and union officials, in heading mass protests against the Bush administration’s anti-immigrant drive in 2006. As the reformist left chimed in with talk of a “new civil rights movement,” the rallying cry of “Today we march, tomorrow we vote” paid off handsomely for the Democrats, who captured the overwhelming majority of the Latino vote in the last presidential elections. The results can be seen in the massive increase in deportations under Barack Obama. Gutierrez, who likes to occasionally posture as a critic of Obama’s crackdown on immigrants, has repeatedly called for the military reinforcement of the border with Mexico and pushed “reforms” of deportation guidelines so that they could more effectively target “real criminals”—the same premise as the “Secure Communities” dragnet. The political shell game in which the Democratic Party postures as the “friend” of immigrants, labor and black people is a central pillar of U.S. capitalist rule. Perpetuating this fraud among workers, the pro-capitalist trade-union leadership acts as a central obstacle to mobilizing labor in its own interests and in the interests of the oppressed—from fighting the ravages of the capitalist economic crisis to defending black and immigrant rights and organizing the “open shop” South. There will be no effective resistance to the immiseration of the working people without the unity in struggle of the labor movement and the black and Latino poor. Our aim as Marxists is to advance the solidarity and consciousness of the entire working class—black, white, Latino; native-born and foreign-born—in the struggle to build a workers party in opposition to all the parties of capitalist class rule. A revolutionary workers party, with black and immigrant workers prominently in its leadership, is the necessary instrument for making the working class conscious of its historic task of overthrowing the capitalist system and building a society where those who labor rule.